More than 2,000 people, mainly from the United Kingdom and Europe, gathered to hear the young head of the Karma Kagyu school of Tibetan Buddhism expound on an 11th century Tibetan text “The Eight Verses for Training the Mind” by the Kadampa master Geshe Langri Tangpa. The Samye Ling community, who had transported everything from Scotland, transformed the hall of Battersea Evolution into a Tibetan shrine room. In front of an antique gold velvet backdrop, hung three thangkas depicting three of the twelve deeds of Shakyamuni Buddha, and a large, ornate throne graced centre stage. To its right a shrine containing an image of Four-Armed Chenresik had been prepared in advance of the empowerment to be held during the final session of the teachings. Two great bouquets of flowers flanked the throne and an abundance of flowers and greenery along the front edge of the stage added a fringe of living colour. Choje Lama Yeshe Losal Rinpoche, head of Samye Ling Monastery and the Samye Dzong organisation, escorted the 17th Karmapa onto the stage. With great devotion and reverence, Lama Yeshe first welcomed the Karmapa to “the most beautiful city in the world” and then thanked all the people who had worked to make the event happen, including the Government of India and the Central Tibetan Administration. It was his hope now, he said, that His Holiness would soon be able to visit Samye Ling, his great monastic seat, which was celebrating its fiftieth anniversary. Moving on to the text for the teaching, Langri Tangpa’s “Eight Verses on Training the Mind,” His Holiness started with a short introduction to the author, Geshe Langri Tangpa (1054 – 1123 CE) whose nickname was “Grim-Faced” because he never smiled or laughed. Contrary to the claims of some, this was not evidence that practicing the Buddha Dharma saddens and depresses practitioners, the Karmapa asserted, but rather proof that Geshe Langri Tangpa was completely immersed in the practices of loving-kindness and compassion. He appeared so serious because he cared so deeply and pure-heartedly about the welfare and suffering of sentient beings. Mind training is a primary focus of the Kadampa tradition, His Holiness explained. One of the most important texts on this topic, the “Seven Points of Mind Training” by Geshe Chekawa Yeshe Dorje, bears witness to the influence that Geshe Langri Tangpa exerted. It was hearing the “Eight Verses for Training the Mind” at a young age that drew Geshe Chekawa into the Kadampa tradition. His Holiness commented that the word mind refers to the mind of enlightenment or bodhicitta: “Mind training really means training in bodhicitta.” “Bodhi” means awakening and “citta” refers to mind. This training is indispensable for those who wish to become bodhisattvas. Mind training texts summarise the main points of training in bodhicitta and, like a manual, provide a step-by-step guide for practitioners to follow in order to develop bodhicitta gradually. The texts themselves are designed to be pithy and easily ascertained: they are short on words but dense in meaning, intended to be memorised and practised rather than just studied. Each of the eight verses taught a different practice which we could use, and through these contemplations, His Holiness stated, we should endeavour to make our hearts and minds vaster and more encompassing. We could learn to differentiate between the conditions which are adverse for developing love and compassion and those which are conducive. With this knowledge we should work to reduce adverse conditions and increase the favourable ones. May I always cherish beings. With that heart advice, the Karmapa concluded the morning session. After he had left the auditorium, people milled around, exchanging comments on their experience of the morning. It seemed that it had been a most extraordinary, profound and joyful experience for everyone. The 17th Karmapa’s humility and wisdom, peppered with humour, had affected them deeply. Ken Holmes, one of the most senior Tibetan Buddhist lay practitioners in the United Kingdom, who worked closely with His Holiness the Sixteenth Karmapa, and is a highly respected Buddhist teacher in his own right, summed it up: “People often ask me “Do you see the similarity between the 16th Karmapa and the 17th?” My answer is “Yes and no.” It’s like when you see a really great actor. Whatever roles they play, once they start acting, your hair stands on end. Yet the roles they play are very different. 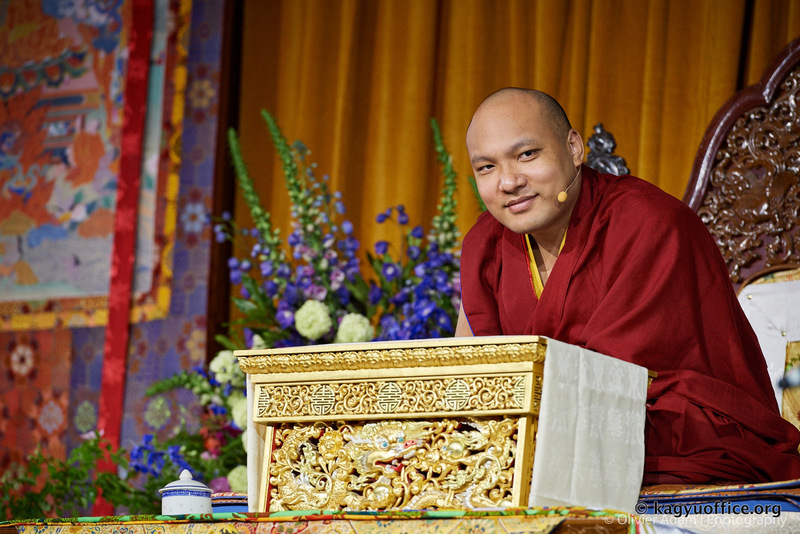 The 16th Karmapa was exactly what was needed for us in the UK in the 1970s, and now, in his teaching today, this Karmapa is giving us not just the words we need to hear, but also the way he does it is what we need to see and what we need to feel. The moment he comes in, there is such majesty you know that you are in the presence of a unique person. 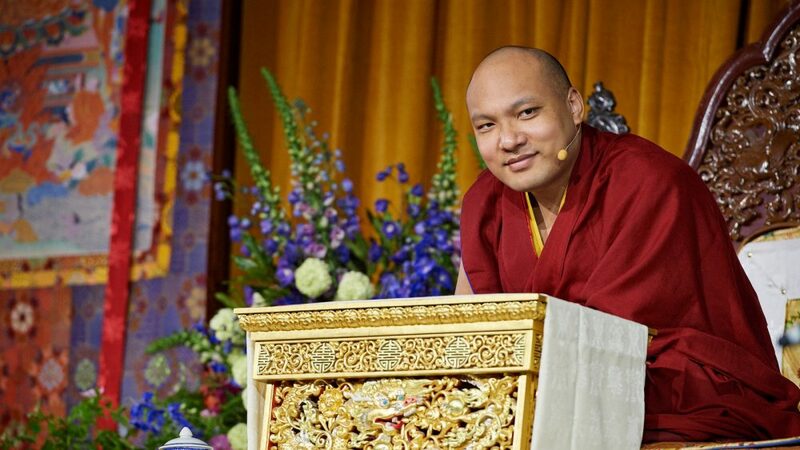 He goes right to the heart of the matter and puts his finger exactly on what’s right for the moment.” After nearly forty years, the Karmapa had undoubtedly returned to the United Kingdom.